This seems like the only way to get me scriptwriting: prosewriting. Or diarywriting. The last time I wrote a daily blog, or diary, was for five consecutive weekdays in March 2011. It was a social experiment, really, as I have neither the time nor the inclination to write at a prescribed frequency – in any case, that would take the fun out of it. I blog when time and inclination align, which is not every day, and is sometimes only once a week. I’m giving it another crack this week because I’m hoping it will get my scriptwriting juices flowing. I can’t reveal anything about either script I am currently writing, as I fear the jinx, and anyway, it would be unprofessional. Last week I believed the hype and stayed away from London, even though I live in London. This was Boris Johnson’s doing. He personally ordered all Londoners to avoid London during the Olympics, and at the nadir of this Soviet-style propaganda campaign, his comedic voice could actually be heard coming out of the public address system of stations on the London underground and overground networks, warning us not to travel during the Games. I kept reading in the papers that Central London had in fact become a “ghost town”. So, having failed to write anything meaningful on Thursday or Friday, I decided to get back to normal, brave public transport, and do a week at my “office”, the British Library, which is where I am now. (The Library Tweeted last week that it was awfully quiet here. And it is quieter than usual. But not empty. And anyway, it’s a library, it’s supposed to be quiet, even when it’s full to the seams.) I’m glad to be here. For the record, these are the songs that soundtracked my commute in. Not sure how interesting that is, but Samuel Pepys only wrote about going out for dinner and then going to bed and he’s the most famous diarist in the world. Anyway, boring day ahead – for you – as I will be sat here, in reading room Humanities 1, with a break for my packed lunch, all day. Will check back in later. And you’re not allowed to take photos in the reading rooms of the British Library so I used one of me sitting in another building that’s strip-lit. *Twitter clearly didn’t go down. God bless the BL wi-fi. It helped immeasurably. Packed lunch: homemade chilli, naturally. Pretty good, if I may say so. The addition of garam masala to my trademark coriander seeds/cumin/mustard seeds/fennel seeds mix made it interesting. I shall be eating this again tomorrow, and the next day, and the next day, so won’t mention it again. I have decided to avoid Olympics coverage for the early part of the evening by going to see a new Hong Kong film called A Simple Life at the cinema. I think the Olympic flame will stay lit without me fanning it. For the record, I was in the next room when Saturday’s historic Team GB victories were achieved, so I heard it, as it happened, and was very pleased for everybody involved and I appreciate what it means for sport and for the national mood, but I am not hooked by the Olympics. I actually find it all a bit overwhelming; so many events, so many heats, so many teams, so many interviews with puffed-out athletes after winning or not winning, so much cheering. I saw the start of the marathon yesterday morning, and heard a commentator say that perhaps the crowds who’d so valiantly and noisily lined the rain-lashed streets of Central London should hold back on the cheering a bit, as they still had another two and a half hours to go. I Iiked the patrician practicality of his advice, but I suspect they did not heed it. These games started with cheering, and they will end with cheering, and inbetween there will have been cheering. It is impossible to be cynical about it. The sport and the people have roundly beaten the sponsors and the politicians, and that’s a result I can get behind. From the next room. A Simple Life was a lovely film; moving and very sad. Ready-garlanded with awards – particularly in China and Hong Kong, but also honoured at Venice – I won’t go into too much detail about its plot. Based on the experiences of one of its producers, and directed by Ann Hui (whose past work I do not know), it’s basically about a movie producer (Andy Lau) whose family servant (Deanie Ip) needs looking after in her autumn years, which he selflessly sets out to do. Perhaps too long at two hours, it was nonetheless gentle and occasionally funny amid the sadness, and showed a slice of modern Hong Kong life. And, like so many films from China and Hong Kong, it was full of food and eating. I even photographed it, because I can. It was accurate, in the sense that the hot water tap beneath the sign on the sink, helpfully marked out with red piping, did indeed produce hot water, when you turned it. The cold water tap, in blue piping, produced cold water. I ran that hot tap for a good long time when shaving, and even at its hottest, it was just above lukewarm. There really was no need to warn me of its temperature with a specific yellow sticker on the wall. 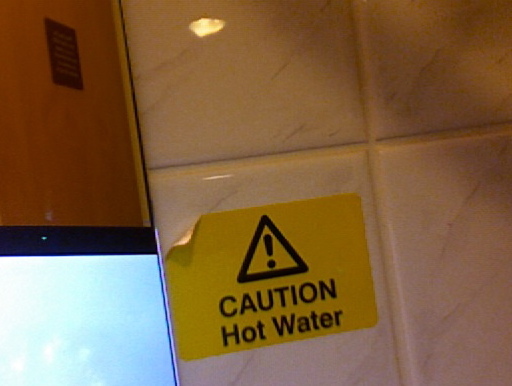 CAUTION Water That’s Nothing Like As Hot As You Expect It To Be, might have been a more helpful and pertinent sticker. This is not a surprise. 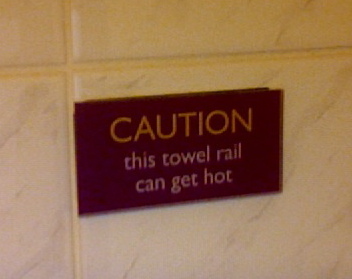 It is a heated towel rail. It is designed to get hot. The switch that turns it on and off was outside the bathroom door, and clearly marked TOWEL RAIL. I did not turn it on. It did not heat up. But had I chosen to do so, in order to use up some more electricity while in the room, I would have pretty much expected it to “get hot.” I am not actually complaining about my stay in the Premier Inn, which was perfectly serviceable, and didn’t cost me that much money. But these danger signs are becoming more and more common, their insidious application to walls and other surfaces clearly driven by fear of litigation, which is one aspect of American culture I was hoping we’d keep at bay, along with prom night, the rude phrase “can I get?” and guns, but we are losing the battle. These signs, blots on a fabulous architectural landscape, render the otherwise beautiful piazza in front of the British Library laughable. And just that little bit less British. Whatever happened to KEEP CALM, CARRY ON AND MIND HOW YOU GO? I understand. I get it. Certain individuals must have tripped up the steps at some point. 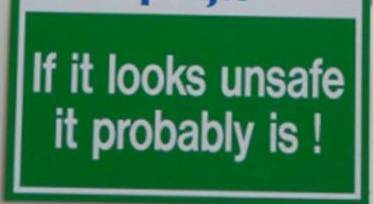 It’s an everyday hazard. We all trip up. I tripped up the escalators at Waterloo station last year. I cut my knee. And even today, because I am still wearing my wedding shoes, which have slippy soles, I slipped while crossing the car park of the Premier Inn this morning, and almost skidded into the path of a thankfully slow-moving van. 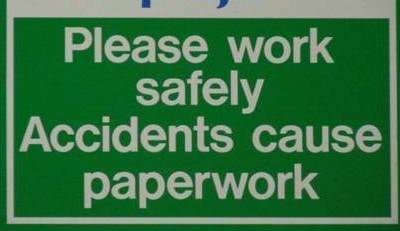 There were no signs up warning me not to do this, so if I had been injured, I could have sued the Premier Inn chain, presumably, and possibly Lenny Henry in person. And by golly, I would have! Although I imagine a crack legal team could avoid liability by shifting the blame skilfully onto the manufacturers of my shoes, which bear no sign saying CAUTION: SOLES CAN PROVE USELESS ON SLIPPERY TARMAC or BEWARE OF ONCOMING VEHICLES WHEN WEARING SHOES IN BRAINTREE. Have we, the public, become more idiotic and clumsy over the past 20 or so years? Have we lost the use of our senses? Or our legs? Can we no longer commune with the climate and work out for ourselves when it might be icy or slippery? Are we constantly burning our hands on things that are designed to be hot? Or are these alarming signs merely part of some broader conspiracy to keep us all in a constant state of panic and fear, and thus distracted from more important issues such as the fanatical dismantling of a once-decent and compassionate society that was built up in the postwar years when socialism was not a dirty word on the left but was ultimately deemed too hazardous to the forward march of monetarism and free market capitalism to maintain.